Researchers tracked hundreds of students in Baltimore to find out what top achievers had that others didn’t. That’s the question undertaken by researchers Stefanie DeLuca, Susan Clampet-Lundquist, and Kathryn Edin, in the book Coming of Age in the Other America. Written in the wake of the death of Freddie Gray, a young man whose death while in police custody in Baltimore ignited a conversation about race, poverty, and opportunity in urban cores, the authors attempt to provide an evidence-based assessment of kids who grew up in the 1980s and 1990s in that city. “The story that had unfolded over our decade of research was strikingly different from the ‘thug’ narrative spun by politicians and news anchors alike” about kids in Baltimore, they write, in their introduction. Take for instance a young man the researchers call Bob (all the names in the book have been changed). He grew up in Somerset Homes, a tough neighborhood in Baltimore where guns and violence were fairly common. Despite challenges at home, he read Shakespearean sonnets in middle school, excelled at math and science, and got into a regional magnet school. Teachers thought Bob had a good shot at going to a top college, but he suddenly floundered in high school and didn’t get into college. He ended up applying for minimum wage jobs after graduating, and now works at a coffee shop at BWI airport. In 2010, the authors interviewed 150 black young men and women who were born in the late 1980s and early 1990s to parents who lived in public housing. They spent hours with the youth, talking to them in cars, in McDonald’s, on front stoops. In 2012, they followed up with 20 who were representative of the group. Coincidentally, they had interviewed the parents of one-third of the young adults through a separate study launched in 2003. In the book—whose title is a nod to Michael Harrington’s seminal The Other America, published in 1962—the researchers track how those kids had fared in various areas between 2003 and 2012, including education, employment, family status, mental and physical health, and risk behaviors. What they found was both hopeful and depressing. The hopeful part: The kids were doing much better than their parents had done. While just 25 percent of parents had a high school diploma and 6 percent had a GED, nearly 70 percent of their kids had a high school diploma. And kids who found what researchers call an “identity project,” essentially a passion or hobby that helped motivate them, went even further, on to college or decent jobs. 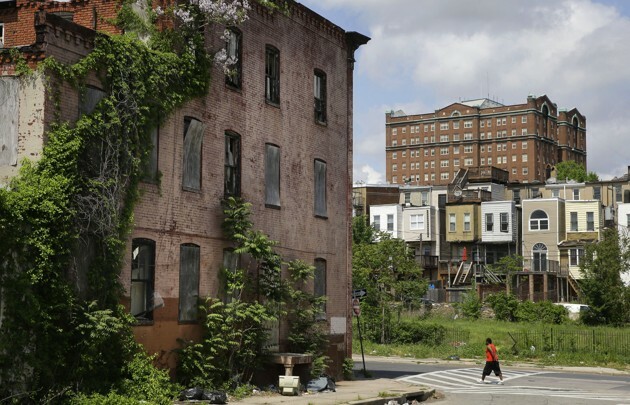 DeLuca, a sociology professor at Johns Hopkins University, has studied families in the Baltimore Moving to Opportunity program, which used vouchers to help move families from poor neighborhoods to wealthier ones. But only some of the families interviewed participated in Moving to Opportunity, DeLuca said. Others were simply exposed to better neighborhoods because the city of Baltimore was tearing down dilapidated public-housing units and helping people move to other areas that—because they weren’t large-scale public housing complexes—were safer. This helps to explain why so many of the children did better than their parents had. “There was a window in which they experienced a dramatic reduction in exposure to disadvantaged neighborhoods, and we think this is a big part of the intergenerational gains,” she told me. The idea that neighborhoods matter isn’t exactly new, though. Where this book differs is that it looks at the other things going on in kids’ lives that can often help determine whether they will excel or not, no matter where they live. And what helps them excel, more often than not, are these identity projects. Bob, for instance, got into Japanese anime as a kid, and then found a passion by following the musical group Insane Clown Posse. Another—whose father was shot in the courtyard of her public housing complex—was passionate about dance, which drove her to apply for and be accepted into a competitive arts school. Another reared pigeons, an interest that kept her off the streets. About half of the youth researchers studied found this “life raft,” which helped inspire them despite tough conditions. Out of the 116 youth studied who are not still in high school, 90 percent of those with an identity project graduated, while only 58 percent of those without one did so. And 82 percent of those with an identity project were in school or working, compared to 53 percent of those without an identity project. Now, the depressing part: Many of the kids who, like Bob, had seemed destined for a four-year college and a well-paid job a few years ago had veered off track. They weren’t using drugs or on the streets, and they were employed, but they were often making minimum wage in jobs with little room for advancement. Some kids went to for-profit universities and didn’t get degrees. Others wanted to get out of their parents’ house so badly that they took whatever job they could, before they had the chance to get the education or training to excel further. “All of this promise gets cut off at the knees, which it doesn’t have to,” Stefanie DeLuca, one of the authors, told me. Even kids with identity projects can struggle. It’s what researchers call the “crabs in the bucket” phenomenon, where the difficulties of environment can drag down promising students. Students whose parents are absent, who are living in overcrowded homes, who are surrounded by crime and blight, often struggled in adolescence despite early promise and despite being passionate about their hobbies. “Even for these kids who seem to have separated themselves from the most disadvantaged, there are parts of their environment that are weighing them down,” DeLuca told me. When researchers talked to Bob’s mother in 2004, for example, she was already planning for him to go to college, telling them she was going to do “whatever I gotta do to get him there.” But then, when Bob was a freshman in high school, his mother and stepfather­—who had served as a father figure to Bob—got divorced. Bob started to unravel. His mother had to support the family on her own, and fell into a deep depression, eventually turning to drugs. Bob’s grades got so bad so suddenly that he was expelled from the prestigious magnet school he’d worked so hard to get into. He was transferred to a worse school, one with arrests and fights, police officers and suspensions. His passions—anime and cards—sustained him, but the resources to help him take SATs and ACTs and apply to colleges were barely present in his new school. He had to nag the guidance counselor for help and never heard back from any of the colleges he applied to. When he graduated from high school with honors, he immediately started looking for jobs, thinking maybe some day, when he had the money, he’d go to college. As his family’s home got more crowded, he felt that he needed to get out. As he moved out on his own, still working minimum-wage jobs, college began to seem further and further out of reach. Bob’s experience suggests that adolescence is a hard time for everyone, but for kids reared in low-income families, it’s a make-or-break time when a few tough situations can send life on a downward trajectory. Many of the youth were so ready to get out of difficult living situations and bad neighborhoods that they jumped at the first opportunity that came to them, even if it wasn’t going to lead them far. Rather than attending four-year colleges, which might have given them the opportunity to try a few different types of fields, they felt compelled to do something quickly so they could begin to provide for themselves. Once they started trade schools and community colleges in one discipline, it was difficult to use those credits to study something else. Often, students would end up at a vocational school because they’d heard a friend went there and liked it, but found it didn’t suit them. Another student in the book enrolled in a program at a college of technology that he was told could be completed in under a year, but had to drop out when it overwhelmed him academically. He’d dropped out of another program to go there, thinking he could finish the second one more quickly. Instead, he ended up $14,000 in debt without a credential or any course work that could transfer. The last time that the researchers talked to him, he was a cashier at Chick-fil-A. Thwarted promise is directly related to kids’ environment, DeLuca told me. They can’t stand their living situations anymore, so are in a rush to get a job or something that pays. And they have a different perspective on how much time they may have to do that. “They’re still exposed to violence and crime at a disproportionate level, which gives them the sense that life is short,” she told me. That can stunt their ability to make decisions with their future in mind. Thwarted promise is directly related to kids’ environment. Many students know just that four-year colleges are expensive and have been warned against going into large amounts of debt, but these warnings sometimes serve to drive them away from colleges and experiences that could have had helped them excel. The authors come away with some very concrete policy proposals for how to help students through adolescence and beyond. They suggest creating more robust mobility programs to ensure that kids don’t grow up in the same concentrated poverty that their parents did and more opportunities for “passion projects” in schools and after-schools by investing more in libraries, clubs, and other institutions, and by expanding funding for the arts. Unfortunately, many cities are doing the opposite, disinvesting in libraries and requiring kids to pay to participate in extracurricular activities. Philadelphia, for instance, is cutting music, visual arts, and theater programs from its public schools. The book also argues for disseminating much more information to low-income students about what happens when they graduate high school, and how the short-term choices they make about where to go to school, what kind of degree to pursue, what kind of job to take, could have very long-term consequences. This means better college and career counseling in high school, more information about how students can parlay community college experience into time at a four-year college, and more information about how different courses of study lead to different jobs. “I can’t underestimate the extent to which there’s a lack of information about how these things end up,” DeLuca told me. Though researchers studied youth in Baltimore, millions of disadvantaged kids across America are likely experiencing the same journey to adolescence and adulthood. Because they had access to so many people for so long, the researchers can see where kids go astray and conversely, what helps them succeed. A journey from poverty to the middle class or beyond is a birthright of many of these kids, their shot at the American dream. But the research indicates they can’t just get there themselves. Like anybody, they need a little help.